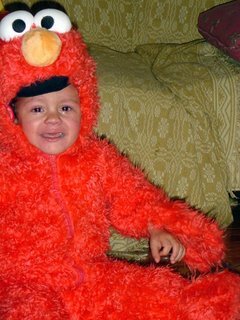 So for Halloween this year we tracked, killed, and skinned Elmo. All of that effort was so Little Man could wear his pelt and take his powers. Much like a silky off the coast of Ireland and the seal suits they wear. Unfortunately, we did all this within sight of Little Man, and he did not want to take part in the barbaric ritual; of wearing dead foes as clothing. He just is too young to truly appreciate ritual yet. Thanks to all the well-wishers yesterday for the Blogaversary. It was truly a stunning lack of real occasion. I had more hits yesterday than I have in a single day ever. So thanks very much for all the attendance to the party, as it were. For all those wondering, Little Man is doing well. He is cranky due to the hunger, thirst, and lack of sleep brought on by the Orapred, but he is breathing. So, we at least have that going for us. He did not participate in the Halloween festivities. His lack of participation was two-fold. Firstly, he is allergic to all major candy types since most are made with yummy creamy butter or other ingredients that he cannot have. MMM Butter. Secondly, as I mentioned above, he really was not all that keen on wearing Elmo’s discarded corpse. He was darn cute in it though, even though we had to fight him like he was a crazed banshee to put the thing on. He is a mighty struggler, that one. He stayed on the porch some while other kids in costume came up and gathered candy from our basket. Then he went inside and ran around naked for a while before his bath. Of course this is all hearsay, because I did not get out of the office until 8:30 last night. Somebody higher up in the food chain at work forgot to mention a meeting that was going on Wednesday that needed stuff done by yours truly and my intrepid staff of cartographers. So, last night and this morning has been a mad scramble. I am tired and without change enough for a Mt Dew from the vending machine. Bottom line, I needs me some caffeine, or somes people gonna die. I just realized that the Haiku I wrote in my comments from the last post was not a true Haiku. It seems that my second line is 8 syllables instead of 7. That is why I have a Poet Laureate of Under Construction instead of filling the post myself.